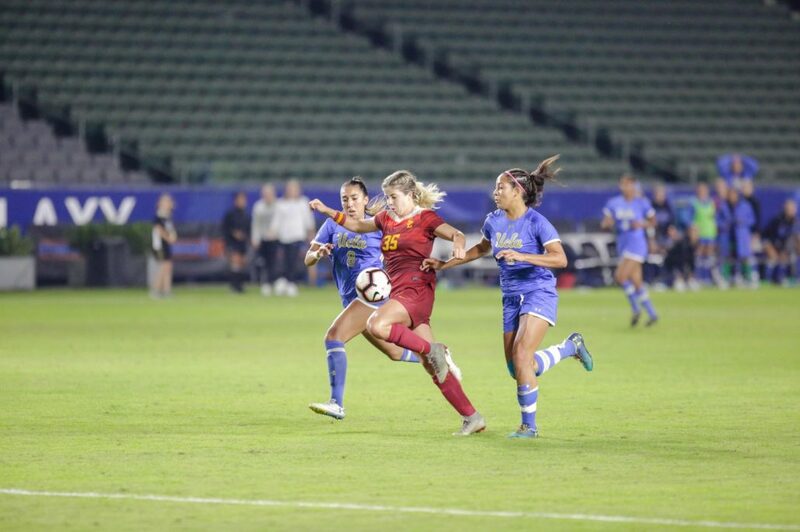 USC seniors forward Leah Pruitt and defender Ally Prisock both became professional athletes on Thursday when they were selected in the National Women’s Soccer League draft. Pruitt was a first round and fifth overall pick to reigning champions North Carolina Courage as the first true striker taken in the draft. From her time at USC, Pruitt tallied 65 points from 22 goals scored and 21 assists in 63 games played. Pruitt also won a National Championship for the Trojans in 2016. Last season, the United Soccer Coaches recognized Pruitt as the Third-Team All-American, and she also received First Team All-Pac-12 honors. She finished the season with 33 points scoring 12 goals and nine assists. Last season, the North Carolina Courage led the NWSL with 53 goals. Pruitt will join forces with the likes of Lynn Williams, who finished second in the league, scoring 14 goals throughout the year. In selecting Pruitt, North Carolina drafted a player who can score for the team, while also consistently pressing defenders high-up on the field. Pruitt is a workhorse forward on-and-off the ball. Prisock was selected in the second round with the 12th overall pick by the Houston Dash. She played a total of 90 games for the Trojans, starting in every game of her college career — even setting a record last season for most appearances by a Trojan player. During her career, she scored one goal and assisted on three more as a defender. Prisock was named First-Team All-American by the United Soccer Coaches and received First Team All-Pac-12 honors last season. The Trojans allowed less than one goal per game last season, conceding 11 goals in 22 games with Prisock at the heart of the defense. Last year, the Houston Dash finished in fourth place to top off a mixed season. The team conceded a total of 39 goals during the season, the second most out of any team, lending Prisock an opportunity to strengthen the team’s defense and lower that statistic. Prisock will reunite with former Trojan goalkeeper and teammate Sammy Jo Prudhomme. Together they won the National Championship in 2016.